Queen Creek is a quaint community in east-central Maricopa County that has a rich history and lots of natural and modern attractions to enjoy. Whether you prefer horseback riding, the arts, historical festivals or sports, you’ll find something to love about Queen Creek. With so many great amenities and experiences in store, it’s easy to see why Queen Creek is the second fastest growing community in Arizona. Queen Creek is home to a number of great schools for children of all ages. Queen Creek Elementary School serves students with a full curriculum of offerings. Queen Creek Elementary has held an “A” rating with the Arizona Department of Education since the school’s inception. The school offers an Enhanced Learning Program for gifted students as well as special education programs for special needs students. Queen Creek High School offers a full curriculum of courses, as well as a variety of career and technical development courses in bioscience, sports medicine, carpentry, graphic design, and more. The school is home to a number of fun teams and clubs like Yearbook, Archery Club, Drama Club, softball, cross country, wrestling, tennis, and volleyball. The area is also home to the Benjamin Franklin Charter School, a dual-campus school that serves elementary, middle, and high school students. This school offers a full curriculum that includes all standard public curriculum subjects, as well as recitations, penmanship, and an introductory graphic and web design course. Queen Creek has a thriving culture industry that makes it a hotspot for families who love to get out and have fun. The area is home to the American Heritage Festival, which is the Southwestern United States’ largest living history event. Since 2003, this festival has presented reenactments of civilian and military life from Colonial times through to the modern period. This festival is also home to Arizona’s largest American Revolution reenactment. Every November, the festival opens for school-only and general public events. The area is also home to Schnepf Farms, a privately owned farm, bakery, and café that offers all sorts of produce and services to the public. Schnepf Farms hosts an annual 4th of July party, where attendees can enjoy hayrides, train rides, roller coasters, a rock-climbing wall, live performances, great food, a feature family movie, and a fireworks show that has been an annual tradition since the 1960s. Queen Creek residents love the local San Tan Mountain Regional Park, which is located just 15 minutes south of the community. This 10,000-plus acre park is one of the Sonoran Desert’s most popular tourist hotspots and is home to all sorts of desert wildlife. The park is a great destination for outdoor enthusiasts, with lots of trails for hiking, biking, and horseback riding through the dusty desert. The local park rangers regularly host night tours, making it a stargazing hotspot. 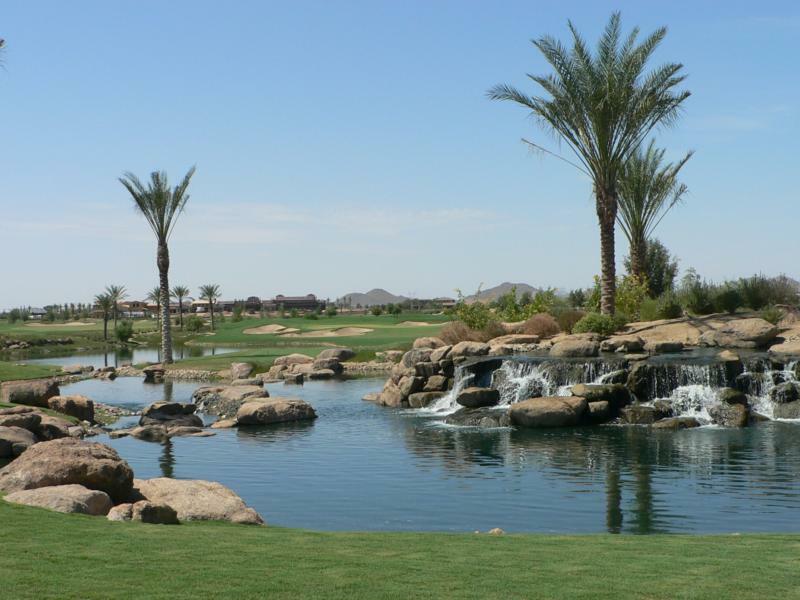 The Queen Creek area is also home to lots of top-notch golf courses. The Trilogy Golf Club at Power Ranch is a par-71 course with nearly 7,000 yards of courses to play. Nestled below the desert mountains, natural changes in the landscape make this course a fun challenge. Looking for a relaxing luxury oasis after a day on the golf green? The Seville Golf & Country Club offers a whole array of activities to enjoy. The local water park makes it easy to unwind after playing the 18-hole course, while the premier tennis facility is great for those who want to stay sharp, improve their game, or learn the basics. Queen Creek is home to a variety of retailers in all sorts of industries. The local Queen Creek Marketplace is home to dozens of stores large and small. In this complex, you’ll find major brand names like Bed, Bath & Beyond, GNC, Kohl’s, PetSmart, The Olive Garden, and Starbucks. The Queen Creek Marketplace is also home to a public art project that honors the city’s history. You’ll also find the Queen Creek Olive Mill on Meridian Road. Comprised of a mill and a café, this local family-owned business provides the community with cold pressed oils, vinegars, stuffed olives, and tapenades. The business proudly supports agritourism, and the owners tout their shop as not just a store, but an experience. Queen Creek is a beautiful family-friendly community with lots of activities, amenities, and attractions to enjoy. Are you ready to experience life in the foothills of the San Tan Mountain? We can help you find your ideal Queen Creek home. Call us today to view Queen Creek real estate – our dedicated buyer agents, who work only with buyers, can help you find the perfect home at a great price.